Location. 34° 30.002′ N, 82° 38.869′ W. Marker is in Anderson, South Carolina, in Anderson County. Marker is on South McDuffie Street south of East River Street (U.S. 76/178), on the right when traveling south. Touch for map. Marker is at or near this postal address: 604 S. McDuffie Street, Anderson SC 29624, United States of America. Touch for directions. (approx. 0.2 miles away); Bank of Anderson Building - ca. 1891 (approx. 0.2 miles away); Anderson County Courthouse Annex Park (approx. 0.2 miles away). Touch for a list and map of all markers in Anderson. Regarding Historic Wilhite House. The house is also known as the Wilhite-Brown House. 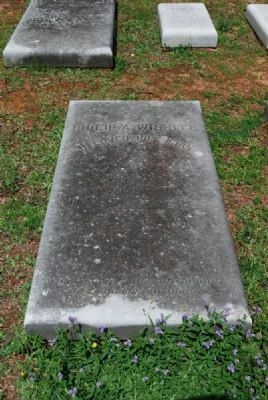 Dr. Wilhite was a native of Georgia but graduated from the medical college in Charleston in 1852 and the next year located in Anderson. Several years earlier he had married Miss Cora Hillis. 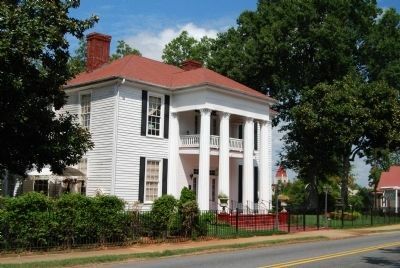 They lived for a few years in the old Towers House on Whitner Street before building their beautiful mansion on McDuffie Street. Dr. Wilhite became a popular physician in Anderson and also owned a drug store with a succession of partners and then his sons, Frank T. and J.O Wilhite. Dr. Philip Wilhite was a member of the U.S. Medical Association and at one meeting of that body he was acknowledged to be the discoverer of the anesthesia ether and it was determined that his services ought to be recognized by the government, but this was never done. He participated, along with Dr. Crawford Long, in the first surgery ever performed using ether as anesthesia. When he died in 1892 he was the last member of the original Board of Health in South Carolina. a disgrace to be a spinster, especially a wealthy one. 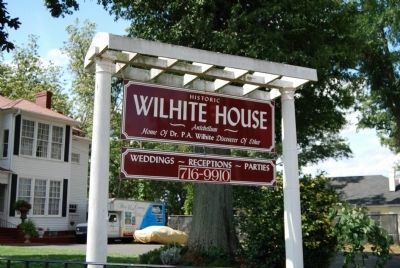 There is often unexplained “activity” following a wedding at The Wilhite House; simple, harmless things like switches being turned off, flowers coming out of vases, female laughter, items disappearing then reappearing the next day. It is my belief that Miss Mary is enjoying the weddings of other brides, because she never had the privilege of being of being a bride herself…which is very sad indeed. 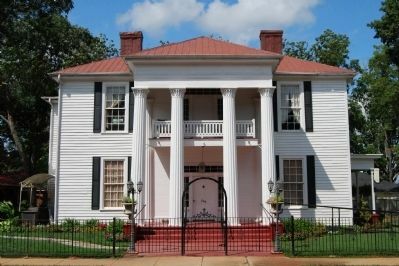 In 1939, John Donald Brown purchased the house where he and his wife, Frances Harper of Greenwood, lived until the late 1980s. The Browns are descendants of George and Rachel Felton Brown who migrated to the Pendleton District from North Carolina in 1805, influenced by their friend, Arthur Gentry. They purchased a 408 acre tract of land for $1.75 per acre from an original land grant made to Peter Keys by Charles Cotesworth Pinckney when he was governor of the state eight years earlier. John Donald Brown's forefathers were farmers until shortly before the Dexter Grocery Company was established in 1903. The Chamber of Commerce brochure of 1909 stated that the company was owned and operated by Dexter Brown, a wholesale dealer in groceries and supplies of all kinds. — Submitted November 2, 2012, by Brian Scott of Anderson, South Carolina. More. Search the internet for Historic Wilhite House. Credits. This page was last revised on June 16, 2016. This page originally submitted on August 25, 2008, by Brian Scott of Anderson, South Carolina. This page has been viewed 2,655 times since then and 21 times this year. Photos: 1, 2, 3. submitted on August 25, 2008, by Brian Scott of Anderson, South Carolina. 4. submitted on November 2, 2012, by Brian Scott of Anderson, South Carolina. • Kevin W. was the editor who published this page.